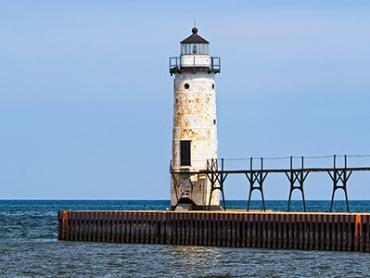 Few states offer fishing grounds as varied and productive as those in Michigan, which has 11,000 inland lakes, 3,000 rivers, and more big-water coastline than Florida and Oregon combined. Needless to say, sport fishing is a major pastime for locals and visitors alike, with millions of fishing licenses sold each year. Michigan borders four of the five Great Lakes, where you can expect to catch the biggest fish in the state. When it comes to sheer variety, however, small lakes and streams throughout the upper and lower peninsula feature some special opportunities. 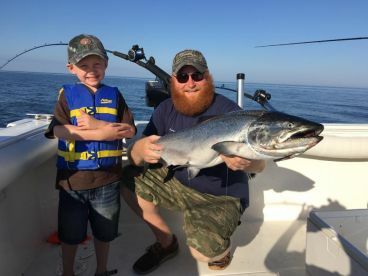 You can take advantage of stellar angling here no matter the season, whether you decide to cast a few lines on your own or book one of many fishing charters Michigan has to offer. Michigan’s upper peninsula is covered in a thin layer of soil, where little grows aside from trees. Here, winter comes early and stays late, which is good news for the state’s most passionate ice fishermen. 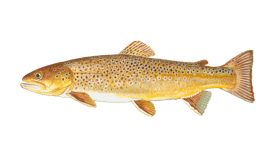 Small streams and lakes host Brook Trout, Bass, and Pike throughout most of the year. 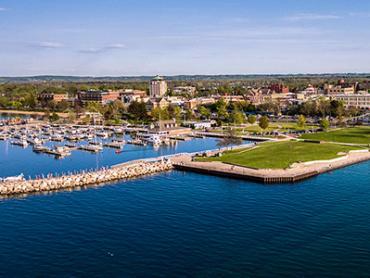 The upper peninsula offers ample access to Lake Superior, the largest and coldest of the Great Lakes. The Salmon in these waters aren’t as large as those in the other Great Lakes, but the fishing is still excellent. In fall, Chinook and Coho Salmon make their way up into the rivers. Tucked away at the edge of Michigan’s state line on Lake Superior sits Isle Royale, a unique and often overlooked little fishery. This national park hosts numerous lakes of its own, which promise good fishing for Brook Trout and Northern Pike. St. Mary’s River is another location worthy of any angler’s attention, where you’ll find incredible runs of Rainbow Trout, Steelhead, and Salmon (including Chinook, Coho, and Pink). On a good day, you can hook into all of these, and maybe even a Walleye or Whitefish, too. Below the rapids, this river broadens and slows down enough to provide excellent fishing for Walleye, Smallmouth Bass, Muskellunge, and Atlantic Salmon in summer. For Michigan fishing fanatics, there’s no better time or place to catch a giant Musky than St. Mary’s River in June or July. The northern portion of Michigan’s lower peninsula features a vast network of rivers with some of the best Trout fishing in the state. 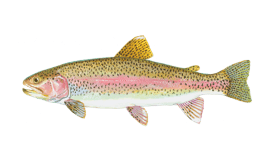 Steelhead runs are strong in spring and winter, with summer runs improving each year. 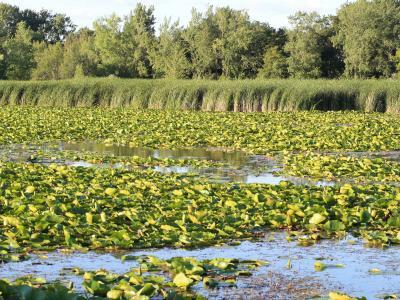 Small inland lakes host Pike, Smallmouth Bass, Walleye, Perch, Sunfish, and Smelt. 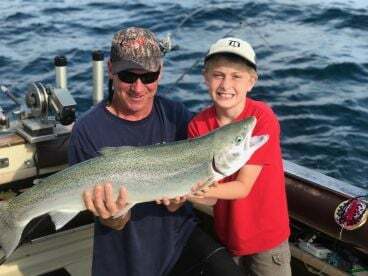 On the other hand, Lakes Michigan and Huron offer Steelhead, Brown Trout, Pacific Salmon (mostly Chinook), and Carp. 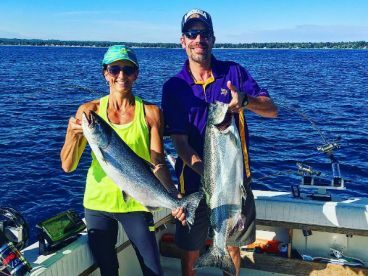 For the most part, fishing in the Great Lakes involves trolling for Salmon in spring and summer. Charter boats use planer boards to troll for Walleye and Steelhead, as well. In areas where the water is clear enough, fly anglers stalk Carp much like stalking large Bonefish on the flats in Florida. Anglers on the lower peninsula also have access to 2 of the world’s best Walleye waters: Lake Erie and Saginaw Bay in Lake Huron. (Little Bay de Noc on Lake Michigan is yet another hot spot for this species, located on the southern shore of the upper peninsula). 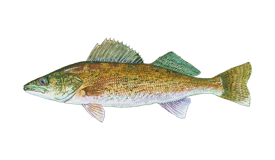 You can expect excellent Walleye fishing on Saginaw Bay year-round, even in winter. In fact, ice fishing in Michigan produces some of the best catches all year! South of Saginaw Bay, the weather grows milder and people are able to fish on open water as early as March. There are few Trout streams in the south, but lots of large, warm rivers with Bass and Pike. Small lakes host Crappie, Perch, Bass, and Sunfish. 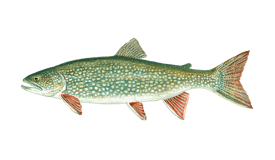 In addition to Walleye, Lake Erie is full of Pike, Bass, Steelhead, and Salmon. Cast your line in the western part of the lake for 10-15 lb Steelhead and Cohos, as well as Chinook weighing up to 20 lbs. 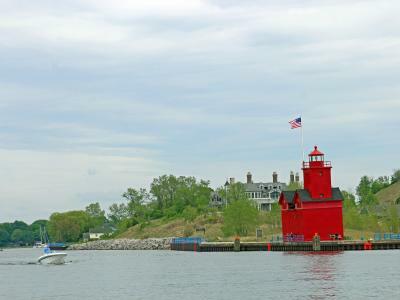 Many fishing trips in Michigan include a visit to the renowned Lake St. Clair. 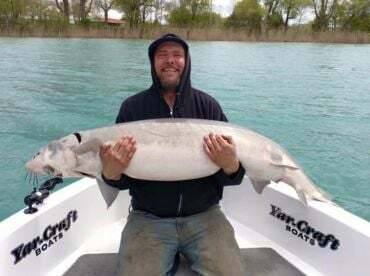 Just 2 miles east of Detroit, this may be the finest urban fishery in the world, where anglers come to land giant Muskellunge and Smallmouth Bass. Tournament boats catch as many as 15-10 Muskies per day—all within sight of the city skyline. 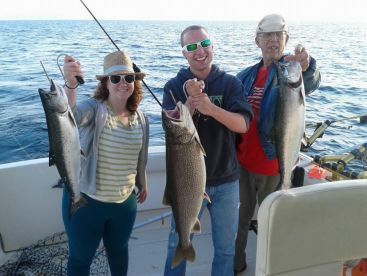 Some Michigan fishing charters can take you across the state border and onto the Ontario side of Lake St. Clair, as well. Insider tip: the best Walleye fishing is on the ON side. With thousands of miles of Trout streams stretching across the inland portion of the lower peninsula, you’ll find Browns, Rainbows, and Brookies everywhere. Every year in late June, local fly anglers wait until dark and then wade into these streams to witness an annual event: the hex hatch. Like clockwork, these mayflies (also called Michigan caddis) hatch in the middle of the night, bursting into a buzzing blizzard that can last for a few minutes or up to several hours. You might be wondering, “So what’s the big deal?” For fly anglers, the hex hatch is the perfect opportunity to fish for Brown Trout, who throw all caution to the wind and start gorging themselves on these flies along the water’s surface. The Au Sable and Manistee Rivers have the best hex hatches of all, which is where you’ll find some of the finest fly fishing Michigan has to offer. Anglers age 17 and older must purchase a MI fishing license, available online. Twenty-four hour licenses cost $10 and 72-hour licenses cost $30 for residents as well as non-residents (prices subject to change). In some cases, buying an Ontario fishing license is also recommended when fishing on waters shared between both states, such as Lakes Superior, Huron, Erie, and St Clair. If you plan on booking a trip with a Michigan fishing guide in one of these areas, be sure to ask about the fishing conditions ahead of time so you can decide if you’re interested in fishing across the border. Trips to ON waters typically include a fuel surcharge and you should plan to bring your passport in addition to an ON fishing license. You can expect safe ice on most lakes in Michigan at the start of the year, with a chance to hook more than a hundred different species while ice fishing! Winter fishing continues, with Michigan’s hardy anglers making the most of frozen lakes across the state. This can be the perfect time to reel in an impressive Walleye, Lake Trout, and more! In the lower peninsula, some lakes are already thawing, giving anglers the chance to head out on open water before the crowds set in. Up north, you can enjoy a few more weeks of ice fishing. Come April, many anglers are packing up their ice shanties and getting ready to haul their boats to the lakeshores. You can expect excellent fishing for Walleye, Trout, Perch, and Musky. May marks the start of the season for many charter boats on the Great Lakes. Come aboard and troll for Coho Salmon, or investigate the inland streams and catch some spring Steelhead. June is a great time to catch large Musky on the St. Mary’s River, or troll for Salmon in the Great Lakes. 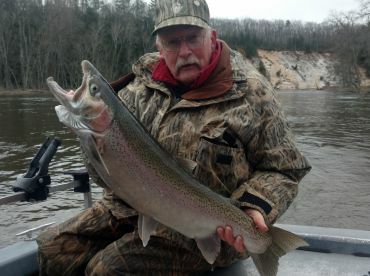 Fly anglers in the lower peninsula are looking forward to the hex hatch later this month. At the height of summer, Salmon fishing is the name of the game. From Chinook and Coho in the lakes to Atlantic Salmon in the streams, these fish keep anglers busy for days! The hottest weather of the year sends Trout deep into the lakes in search of cool water. With a savvy guide and the use of downriggers, you can still have good luck fishing for them! In autumn, many Salmon start leaving the Great Lakes and heading upstream. As the charter boat season starts coming to a close, guided fishing on the rivers picks up momentum. This is a great time to fish for Salmon and Steelhead in Michigan’s streams! Bass fishing on small lakes is also excellent. 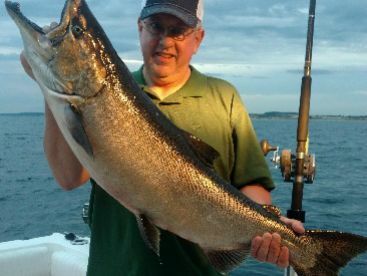 Some anglers are still fishing open water on the Great Lakes while it lasts. Come November, you can expect most lake charters to shut down for the winter. Guides with aluminum boats will still be eager to take you through the streams in search of Steelhead and more. Michigan’s lakes start to freeze over in December, with the shallowest of them already offering safe ice early in month. Grab an ice auger and a rod and head out for some prime winter fishing! "Half day with About Time Charters"
Hire a guide if your new to the Detroit walleye fishery as the crowds can be heavy.